This South African evergreen is usually grown as a houseplant, especially in colder regions. Also known as Bush Lily, Flame Lily, Forest Lily or Kaffir Lily. They have stout stems to 2 feet and dark green leaves. The flowers are funnel-shaped, but more trumpet shaped than tubular and face outward. PLEASE NOTE that we sell bare root slips, and it can take 2 to 5 years for the plant to mature and flower. When mature, the plant will require a dormant period of 6 to 8 weeks in early winter - keep plants in a cool area (less than 50 degrees but above freezing). After the rest period place in a heated room and keep nearly dry until flower stems are growing strongly and then water and fertilize freely from flowering to mid-fall. 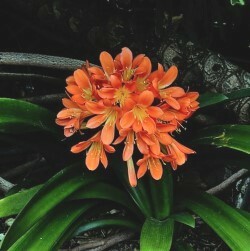 Clivia Miniata - also known as Kaffir Lily - is mainly grown from tuberous roots as a houseplant - it will not tolerate any frost. The thick stem bears a cluster of 10-20 bright orange funnel-shaped flowers at its tip. It likes dry air, dry soil and bright light with no direct sun. Rest it in winter in an unheated room. It needs to be divided every few years. 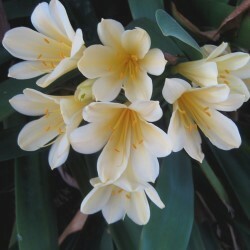 Please note: Clivia are grown in pots and may be shipped a bare rooted plants. Browning on leaves is normal since we stop watering and lower temperature to force dormancy. They should take right off again when planted / re-potted. Clivia Miniata Citrina is the yellow form of Clivia Miniata.